Well three days into our second month of Daddy Day Care, and Dad hasn't broken the little one yet. Today Oliver had his first Gymboree Music Class. 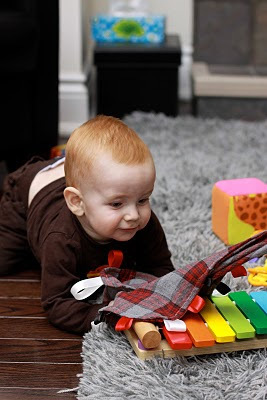 And just like the first time at Gymboree, and at Rainbow Songs, and the second times for that matter, he cried. New surroundings, new activities and he was suspicious. He warmed up quickly though, even if it was "Diva Day" - sing it sista! It was also essentially a private class. None of the other registered kids made it. Something about a nasty cold going around. So there was Dad and Oliver dancing and singing to Diana Ross, Shania Twain and Judy Garland. Good thing Gymboree has one glass wall so all the passing shoppers can have a good giggle. He's definitely being a funny monkey these days though. Next stop was the sewing store. Dad needed craft supplies! Has this gone too far? At least Oliver got a "tag blankie" out of it. Well a very rudimentary and wonky tag blankie. Next do we dare try to make some clothes? I can hear him saying in 20 years "Dad those clothes you made me were not cool. I was laughed at for years." And there I was, being Crafty Daddy! He seemed to like the blankie though. 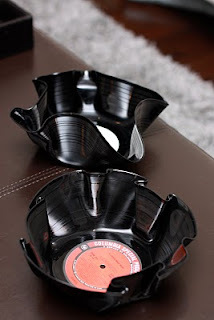 Dad also entertained himself earlier in the week by making bowls out of old records. Amazing what nap time and the desire to avoid doing chores can combine and produce. Dr. Frankenstein just needed the right conditions! Anyone need any last minute Valentine's Day gifts? I'm sure I could pump out a bunch more!